Plastic overall is a horrible substance for our environment, from the making of plastic products to the discarding of it. You see, plastics are made from resins that you get from oil fracking, which we all know is bad. Once those plastics are used, the majority ends up in oceans or landfills, even if you do recycle. Plastic also never biodegrades. It simply breaks down into smaller pieces of plastic for us to ingest later on. 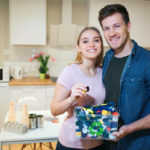 Luckily, there are plenty of eco-friendly plastic alternatives out there, especially for the many plastic products we use in our bathrooms every day. 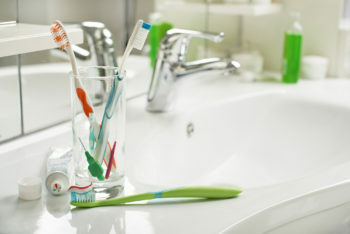 In fact, the majority of the plastic you find in your bathroom is replaceable with greener options. So here’s how to reduce plastic in the bathroom for eco-friendly apartment living. 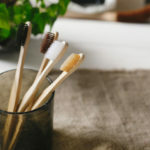 The bamboo toothbrush is becoming more popular and for good reason. Bamboo is sustainable as it regenerates very quickly and with little resources. It is also biodegradable. You can change out your plastic cased toothpaste as well. Brands like Bite package their toothpaste bites in a reusable glass bottle. You only use a disposable razor for about a week before throwing them out, making them one of the biggest wastes of plastic in your bathroom. Replace your current razors with a safety razor. A safety razor will last you a lifetime as they are made purely of metal and you can recycle your old blades. One great brand is Albatross where they also have a razor take-back program. Liquid soaps are usually packaged inside a big plastic bottle and have to be replaced every few months. A good alternative is bar soaps. They are usually packaged inside a cardboard box, which is biodegradable. You can even get shampoo and conditioner in a bar from companies such as Beauty and the Bees. 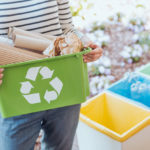 By switching out as much plastic as possible with these eco-friendly alternatives, you’ll be reducing the number of plastics that end up in our oceans and landfills every day. 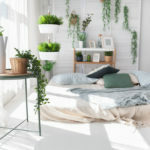 To find out more ways to live eco-friendly, contact us today. We’re happy to support your go green lifestyle choices!